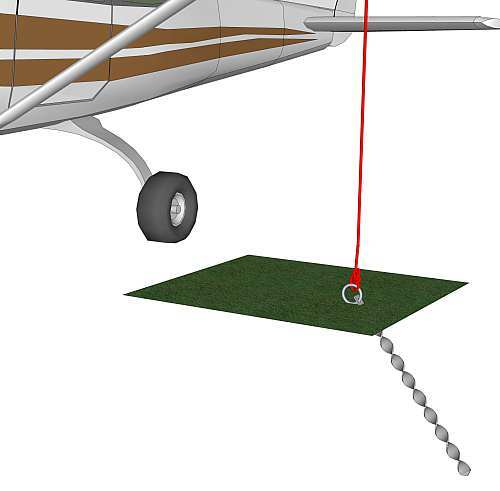 Our aircraft tie down anchors provide permanent or temporary ground fixings to secure light aircraft in open ground. They are easy to install in any weather and can be quickly removed without damaging the ground. They are not suitable for carrying in an aircraft as they are far too heavy. 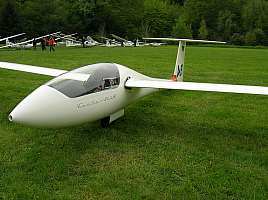 Owners of small aircraft and gliders know that if the aircraft is to be kept outside, it must be anchored to the ground, as strong wind can easily flip it over. 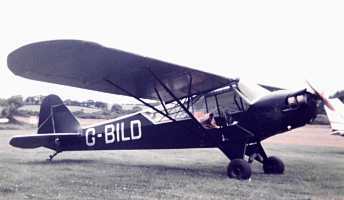 Tailwheel aircraft are especially vulnerable - with no one on board, the reduced weight means with headwinds as low as 30 - 40 mph, the aircraft can start 'flying' on its own. 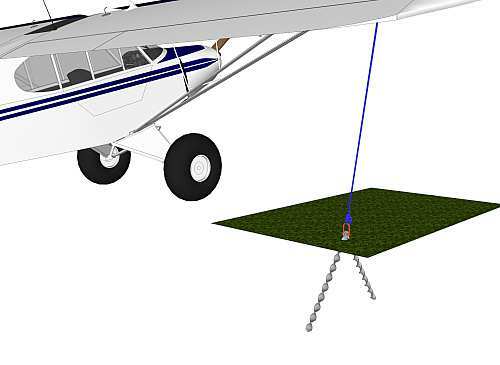 The anchors are very useful for operators of small airfields, as heavy duty tie downs can be provided for air rallies and shows (and general emergencies), without needing concrete, also they can be removed without disturance to the ground. Our anchors offer exceptional loadings, however, they must be prevented from rotating and unscrewing themselves, in many sitiuations, rotation is prevented by a bracket, where there is no bracket, always hammer the anchor in at an angle of between 30 and 45 degrees to the direction of pull, otherwise they will rotate out. Methods of providing a lashing point, (in order of cost). 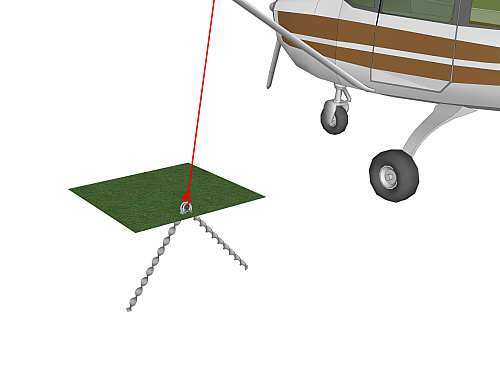 1/ The simplest method is to make a shallow depression in the grass, normally with a couple of sledge hammer blows in the grass, hammer a standard Erdanker anchor in at an angle to the expected direction of pull, hammer to below ground level, fit a shackle. The shackle will lie flat when not in use. 2/ As above but use a chaining anchor, these have a 16mm hole instead of the standard 10.25mm hole, the larger hole allows for a larger shackle to be used. 3/ Use a ring type anchor, hammer in at an angle to just below ground level, no shackle is needed. 4/ Use 2 ring type anchors. This has 2 advantages, firstly, the obvious one of double the load capacity, secondly, when the rings are bound together, neither anchor can rotate. 5/ Use the W series bracket with 2 low head safety anchors. To start, make a shallow depression in the grass with a few hammer blows directly in the ground, hammer 1 anchor in, through a slot in the bracket, then hammer in the other anchor. Important: we do not guarantee our anchors will hold in all situations. The person putting the anchors in must use his or her own judgement. Problems can occur with very soft ground, sand, recently dug ground, mud etc.